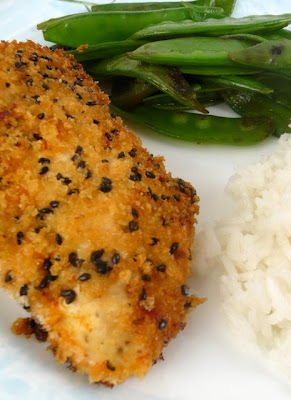 This recipe is not the ordinary sesame chicken that you would likely order from a Chinese restaurant - that version is so thick with breading you can hardly find the meat - and when you do it's tough and chewy. This version is extremely flavorful with moist chicken and a kick of heat. I love that it uses black sesame seeds - I think they provide a lot more interest in the presentation of this dish. My husband and I really enjoyed this - definitely something I'll continue to make as an easy weeknight dinner. I scaled down the original recipe to only make it for two - but you can easily double or triple this recipe as needed. 1. In medium bowl, combine chicken, sesame oil and garlic chili sauce. Coat well and place in fridge (marinate chicken for at least 20 minutes and up to 2 hours). 2. Remove from fridge when ready to cook and place a nonstick pan on stove over medium heat. Add olive oil and heat over medium until almost smoking. 4. In a shallow bowl, add bread crumbs, garlic powder, salt, pepper, sesame seeds and toss to combine. 5. Place chicken breast into bread crumb mixture and coat well. 6. Place into hot pan and repeat with remaining chicken breast. 7. Cook until golden in color on one side, about 2-3 minutes and flip. Cook an additional 2-3 minutes and place pan into preheated oven. 8. Bake until internal temperature of 160 is achieved (do not over cook) and remove, about 10-15 minutes. This version looks good although I have gotten used to not using any breading for my chinese dishes. It's just healthier. I just made this tonight and it was so yummy! It was crispy and juicy and spicy and delicious. Mine came out a lot lighter looking, though. How did you get that nice orange color? Glad you liked it Stephanie - you might need to get your pan hotter when you cook it to make it more golden brown.